English Translation: Va'tet is the Vastine Amorte word for "Silver Sun"
Appearance Age: Physically, Va'tet is around sixteen or seventeen years old. Actual Age: Va'tet is approximately a thousand and seventeen years old. Organization and Rank: Va'tet is a member of the Gotei, having belonged to a group of Fifth, Third and Second Division members as part of an experimental team. Her official rank was Third Seat in the Fifth Division, but she was the recognized as Temporary-Captain of the Recon Team. The Recon Team was disbanded during the Quincy Wars. Height: As most Vastine Amorte tend to be, Va'tet is very tall. She stands at six feet and two inches tall, not counting her boots or wings. Her boots add an extra inch to her height, while her wings, fully extended, add an extra four inches to her height. This means that Va'tet stands at six feet and seven inches. Weight: As with all Vastine Amorte, her body is deceptively light. Va'tet only weighs seventy pounds, however in her armor she weighs ninety three pounds. Hair color: Va'tet has white hair, though it is not uniformly white. It varies from the purest white to a very pale straw color, and this coloration continues on her feathers.The feathers on her wings and legs are mostly, but not all, very clean white, though there are some that are darker near the edges. Eye color: Like all Vastine Amorte, Va'tet has eyes that are swirls of color around an incredibly black pupil. Her irises are large and fill almost the whole eye, and are constantly spinning circles of colors, reds, blues, browns, greens, yellows and whites. General Appearance: Va'tet is a very tall young Vastine Amorte woman. Va'tet stands at over six feet tall, but like most Vastine weighs very little, allowing her wings, of which she has four, to carry her. She does not wear a typical Shinigami's garments. 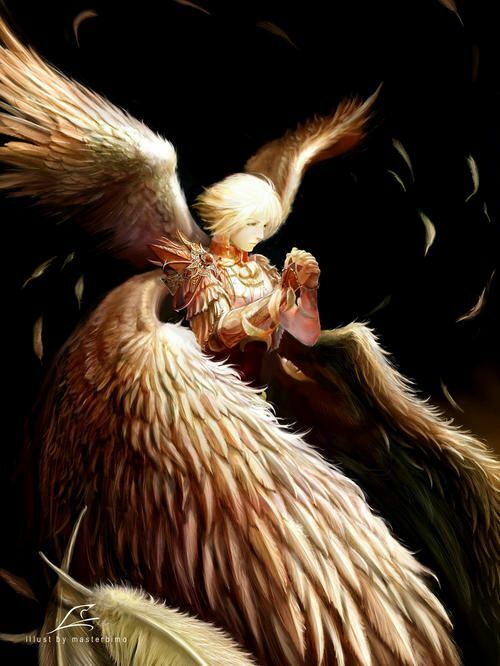 Va'tet has white-blonde hair, and four white wings. Her wings can come together and then fold to fit along her back, but they cannot fold up against her spine. Her wings are visible even when folded because they're so large. Her upper wings are half the size of her lower wings and arc upwards while the lower wings spread either outwards or downward. She can bend her wings forward to cover herself. Like all Vastine Amorte, Va'tet has cone-shaped ears ending in tufts of feathers, but her ears are hidden by her hair, which is just long enough to frame her face and cover her neck. Her face is a plain sort of pretty, with the Vastine Amorte swirl-style eyes, though hers are more bird-like, with irises that fill the whole eye. She has a short, sharp nose and colorless lips. She has a soft jaw and very smooth, wrinkle-less skin. Instead of wearing a Shihakusho, Va'tet instead wears feminine but knightly armor. The armor is pink with metal paulderons set over a leather and fabric tunic-like breastplate. The sleeves are sown to her gauntlets, which cover the entire forearm and the backs of her hands, tapering to her middle fingers, where a fabric loop holds the gauntlet in place. Her upper arms are covered in leather, which is in turn covered in ruffled fabric. Both her shoulders have small paulderons, triangular prisms of metal that look rather ornate with jewels set into them. The paulderons in turn are connected to armor across her shoulders that turns into a high metal collar around her neck. Her chest is covered by leather, with thin metal over that, over which fabric is stretched. The breast plate does not cover her stomach, which is covered by a leather shirt tucked into a metal plate skirt. Under the skirt of metal plates, she wears dark-red leather pants. Her feet are usually covered by boots, but she frequently goes barefoot. She carries Muerte on her left hip, the scythe-shaped Zanpakuto fastened by a leather belt to her skirt. Previously, when she was a child, her own Zanpakuto was held there. Loyal- Va'tet has absolute loyalty to the Gotei. She believes that the Gotei is always just and that any commands given by the Commander should be obeyed until her dying breath. Dedicated- Once Va'tet has been given a mission, she will see the mission through to the end. No matter how bad things get, she will never let the thoughts of failure or giving up cross her mind. Honest- Having been raised by Vastine Amorte, specifically Ma'kine, Va'tet does not believe in lying or cheating in any way or shape. She doesn't believe in using underhanded tactics or trickery in battle or for social or personal gain. Like most Vastine Amorte, she is wholly honest and straight forward in all aspects of her life. Merciful- Va'tet gives her enemies two chances, regardless of how badly she is outnumbered. The first chance is to abandon the fight before it starts, the second is to surrender before she dismembers them. Trusting- Because Va'tet would never lie or cheat, she assumes everyone else is the same. This is why she had been waiting on the retrieval team for six hundred years, because she honestly believed that her Second was going to rescue her. Honorable- Va'tet would rather fight a one-on-one battle, and uphold every promise she has made, than do something even the slightest bit wrong. Naive- Va'tet is blissfully unaware of most people's true intentions and will take things at face value. She's unaware that people can be underhanded and purposely alter their behaviors through drugs. She assumes all actions are conscious, planned decisions. Overly Trusting- Due to her naivety, Va'tet believes people whenever they make a promise or say they will do something. This has led to her being abandoned in Hueco Mundo for so long, though she holds no resentment over having been abandoned. Uninformed- Due to having spent so long in Hueco Mundo, Va'tet is unaware of any technological or social changes that have occurred in the last six hundred years. Even after her return, she is still quite uninformed and relies on Muerte or others to aid her in her day to day life. Cold- Due to the cruel world she grew up in, constantly fighting for her life, Va'tet has essentially lost the ability to sympathize and emphasize with others. She has also deeply suppressed her emotions, hiding them behind a cool, hard mask of reality. Harsh- Due to her inability to relate to others on an emotional level, and her inability to lie, Va'tet speaks the absolute truth, unclouded by emotions. She will, without wavering or mincing words, tell somebody how they will lose, or how much pain they will be in. Literal Minded- Va'tet does not understand concepts of metaphors, hyperbole or lies. She takes everything as it is said, exactly how it is said. Unforgiving- Va'tet, though merciful, does not forgive those who wronged her. She repays their unkindness with absolute destruction and maximum agony in battle. Creepy- Va'tet does not make facial expressions or fluctuate her voice often. Being a master of stealth, she usually has very little presence until she wants herself to be known. This often leads to others not knowing she is behind them until hers and Muerte's energies are suddenly visible. With her weapon giving off the sense of an incredibly powerful Hollow, this can be incredibly unsettling. The Seireitei- Having been raised by Ma'kine for her youth, Va'tet has enjoyed a life in Seireitei and has seen the good that the Gotei and the Baozhai Family has done. The Baozhai Family- Va'tet, having been raised by Ma'kine, spent a great deal of time amid the Noble Giants and admired the Head of the Family, a man by the name of Junichiro Baozhai, who she know Ma'kine held in great respect. That meant that Va'tet, too, should respect the man. Kido- Ma'kine taught the young Va'tet everything he knew about Kido when she was a child, so she became very good at using high leveled Bakudo and Hado, though like her mentor, she is only average at Kaido. However, after spending so long in Hueco Mundo, she has forgotten most of what she knew. She wishes she could cast Kido again one day. The White Desert- Having spent the greater part of her life living in Hueco Mundo, she can't help but see beauty in the endless sand and ruins. She admires the quiet peacefulness of it. Reading- Va'tet loves to read. She thoroughly enjoyed Ma'kine's library as a child and during her time in Hueco Mundo she has read the various books her team had brought to base camp thousands of times. Calligraphy- Like her mentor, Va'tet is skilled at the art. Snakeblood soup- She has fond memories of eating snakeblood soup with Ma'kine, but does not remember what it actually tasted like. Singing- With nobody to speak to besides Muerte, Va'tet has taken to singing nonsensical songs to interrupt the silence of camp life. Bright lights- Centuries of living in the White Desert has made her used to the dark or traveling by moonlight alone. Bright lights physically hurt her to look at, including the artificial light of Las Noches. Arrancar- Centuries of defending her camp from Las Noches and the hollows of the White Desert have acutely raised her natural dislike of Hollows and Arrancar. Traitors- Anyone who turns their back on their own people cannot be trusted ever again. Traitors should be met with maximum force to prevent any further disruption from them. Killing- Va'tet hates the idea of taking a life. It goes against some inner core of good, she believes. However, she sees it as a necessary evil needed to defend herself until her mission is completed, or to protect the Gotei's interests. Spiders, snakes and similar creatures- Either having too many legs, or none at all, unnerves Va'tet. Though she consciously knows better, she feels its unnatural that something with no legs can move so fast. Her Second Officer- Kamiori Uso, the Second Officer of her Recon Team, was a man in his late forties when she knew him. He followed her orders well, leaving her to fend off Las Noches' Arrancar without ever looking back or offering to help. After learning the truth, she felt disappoint in being unable to punish him for his behavior in lying about her death. Personal Habits: Va'tet, having spent so long with only Muerte to talk to, has a tendency to over-speak, repeating the same information in several different iterations without really moving the conversation forward. Short-term Goals: To find her place in the modern age. Long-term Goals: To surpass Ma'kine in terms of how helpful to the Gotei she has been. General Personality: Va'tet is a strange young woman. It's hard to understand her because the majority of her life has been spent away from other people. Outwardly, Va'tet seems to be an emotionless person who is wholly focused on her mission. For hundreds of years, she has been waiting in Hueco Mundo at the Recon Team's camp for a rescue party so that she may complete the mission. When she does speak, it's in a cold monotone, her face without any expression. Even when engaged in battle, her face does not show any exertion on her part. She rarely speaks, but when she does, she has a habit of repeating the same sentence over, with different variations each time. She also carries herself fluidly, always focused on the tasks at hand and little else, completing her goals with cold, usually silent, efficiency. Though she is willing to be merciful to her opponents, she fights with brutal efficiency, her scythe and guns eliminating the enemy by reducing them to a quivering pulp of living flesh, often going straight for beheadment or destroying the target's joints. However, beneath her cold indifference lays an emotionally scared girl. She never knows if today will be the day she's rescued, or killed, and so she has adopted the outward appearance of cold confidence to hide her true feelings. In reality, she craves contact with others, though she no longer remembers what that feels like. Va'tet clings to her mission because that's what a leader is supposed to do. She misses the Seireitei, the Commander and Ma'kine, but she can't recall what any of them looked like, or what they felt or sounded like. She remembers impressions of them only, and it breaks her heart. She is adamant about repeating her daily routines even though she doesn't know when a day is over. Cleaning her equipment and organizing the camp is a ritual she needs to keep her sanity. The incredible pressure of never knowing when an enemy will attack, or having to steal into Las Noches to find food, would have driven her insane if not for her rituals and focus, and no short amount of willpower. Something Special: Due to being the wielder of Muerte, Va'tet does not initially feel like a Shinigami but rather gives off the impression of an ancient Vasto Lorde or even a Black Lands Hollow. However, closer inspection reveals that the feeling radiates not from her, but rather from the Zanpakuto she wields. Her own spiritual pressure is hidden behind that of her weapon normally, but in battle the two blend together until it feels as if she actually is a Hollow. Muerte's Reiatsu is overwhelming and can appear of its own volition, or hide itself. Muerte can signal his displeasure by flaring his own Spiritual Pressure from his weapon. He has a high level of sentience and actively participates in conversations with Va'tet and others, whether through Reiatsu fluctuations or by physically manifesting himself. Like all Vastine Amorte, Va'tet can see beyond the visible light spectrum. Sealed Zanpakutō: In its sealed form, Muerte takes on the appearance of a short scythe rather than a sword. The scythe has a short handle wrapped in purple cloth. The base of the scythe has an opened ring upon it. The upper portion of the scythe is black, with a crude, chipped and scarred scythe blade coming off one side, counter to a beastly skull complete with teeth in a snarling appearance. On the blade's side is "Muerte" written in Vastine runes. Release Phrase: "Make them beg, Muerte." Shikai Appearance: Muerte's Shikai is a clad type that covers Va'tet in Muerte's clothing. 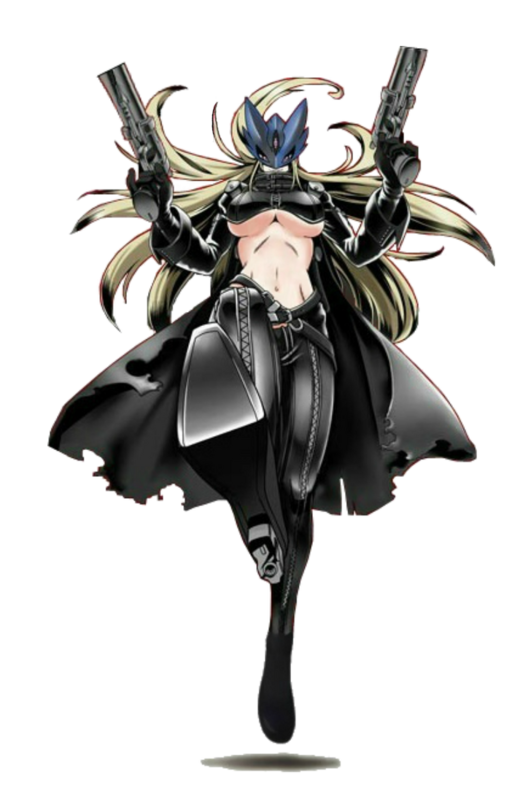 In this form, her own clothes disappear and are replaced with black biker-style clothing, including his boots and jacket. In this form, she wears a half-jacket that completely covers her arms but only comes down to her lower ribs. The jacket has a fur neckline, and metal studs and plates on the upper shoulders that give the appearance of skulls. The jacket is left open and she wears nothing underneath, though the back is slit to allow her wings freedom to move. She wears thick metal bracers on both forearms. At her waist she wears too heavy belts that hold up baggy jeans. The right pant-leg has a skull emblem on it and two leather bracelets around her thigh. At her knees are tight wrappings and knee-coverings. She wears heavy knee-high boots to which two metal gun holsters are strapped by metal bands. Her boots are three curved blades rising from the toe of the boots. She uses two revolvers in this form. Shikai Ability: In Shikai, Muerte's ability is to reject death. Anything shot by the two revolvers or attacked with any physical part of Va'tet's body is unable to die regardless of any injuries it sustains. This does no affect the target's ability to feel pain however. No amount of damage done by Muerte will kill the target, not even completely destroying the victim's body save for the head. Only by losing the will to live can a victim finally die. Va'tet cannot die of her injuries either, regardless of how baddly she is hurt. Many assume the power lies in the reishi bullets Muerte fires, which are similar to Balas. However, this is partially inaccurate. The truth is that the bullets are only transferring Va'tet's death immunity to her victims. Muerte protects Va'tet first, then weaponizes the protection he gave her. Bankai Name: Shi no bochi; senshi no fīrudo, or "Muerte's Cemetery; Field of the Warriors." Bankai Appearance: Bankai fuses Va'tet with Muerte further. In this form, Va'tet's biker style clothes become more refined and become tight leather. Her half-jacket zips closed and now only covers the top portion of her breasts while she loses the fur collar. Instead the collar becomes stiff leather that overs her neck and chin. She loses the gauntlets in this form as well. Her stomach is exposed, but her back is covered by a cape that is capable of transforming into either long arms or wings. Her own wings are tightly hidden under the cape. The two belts now slide down, forming an X across her hips. The baggy jeans now become smooth, tight leather are are fused with her boots, making it appear that the boots go all the way to her hips. The boots have lost the claws, but become heeled. Both heels are actually gun barrels that she can use with her mind. In this form she constantly carries her two revolvers. In Bankai, Va'tet know wears a blue mask that covers the face but her mouth. The mask shows both her eyes through triangular slits, but possesses a third vertical eye. The mask is pulled backwards and upwards, covering her ears, but allows her hair, which has grown far longer, to hang down her back and has two strands of hair down her shoulders. Bankai Ability: In Bankai, Shi no bochi; senshi no fīrudo turns Muerte's Shikai ability into an area of effect. Anyone within two hundred meters of Va'tet becomes immune to death unless they willingly choose to die. However, even the mere thought that one can die is enough to cause them to. To survive in Shi no bochi; senshi no fīrudo, everyone must maintain the belief that they will live. Spirit Appearance: Muerte takes the form of a Vasto Lorde with a black mask and a biker appearance. He is a very tall male Vasto Lorde with a very humanoid appearance. 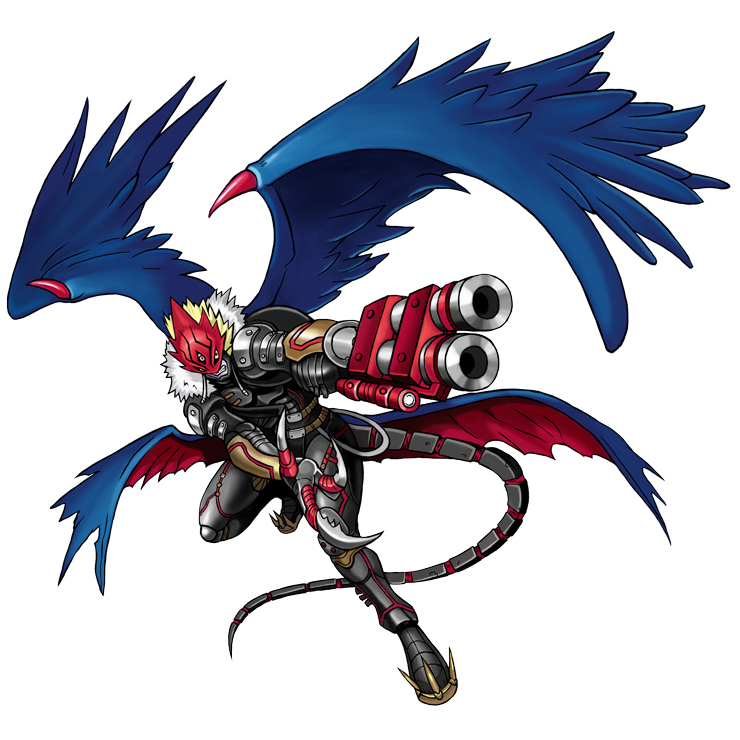 He does however possess four raven wings and a metallic tail growing from his spine. He is slim but muscled, wearing what appears to be a leather jacket with a furred collar and metal studs on the shoulders. He has a red scarf tied around his left upper arm and his clawed left hand is covered by a metal gauntlet. His right hand seems to be fused with a massive cannon-like gun. He wears black leather pants supported by two belts, with knee high spiked boots. He has a shotgun holstered to his left boot. His mask is black-blue and leaves his lower jaw visible, making him look very similar to Arrancar. He has three green eyes and blond hair. In Bankai, his physical appearance changes. His coloration changes significantly, his raven wings turning blue while his lower wings are blue on the back red on the front, also growing significantly larger. His mask also turns red, while the metallic parts of his body become golden in places such as the forearms, knee and feet. In this form, he has his right hand turned into a three-digit hand with long claws. The left hand becomes a double barrel blaster. His body is also more streamlined, with tighter fitting pants and boots, while his tail is thinner and longer. Spirit Personality: To summarize Muerte in a word, it would be sadistic. Or bloodthirsty. While initially it seems that the Prince is rather mindless in his desire for fighting, this is not true. In fact, Muerte uses his power of rejection of death to extend his battles for maximum enjoyment and is very analytical. He will often notice the enemies' weakness before Va'tet will and will assist her in fighting, but he does so for selfish reasons. If she were to fall in battle, he would be returned to his base form and transported back to Las Noches, unable to fight until he found another user. Strangely, though Muerte loves to fight, he chose to become Va'tet's weapon because of her desire not to kill. He enjoys torturing Va'tet with the fact that he has never taken a life since she obtained him, for all of his victims would not die and she's haunted by their constant screams of agony. In his own way, however, Muerte has grown fond of Va'tet as time went on and she slowly became less and less emotional. He finds it strange that she is so dedicated to her mission and job that she was willing to nearly completely suppress her emotions and repress the memories of what she's had to do to survive. Muerte eventually started to look out for Va'tet in ways not strictly dictated by the pleasure he derived from her pain or their enemies. Inner World: Originally, Va'tet's inner world was an endless plain of eternal sunshine, with high grass and sparse trees. No buildings or man-made creations existed in this world, and there was forever a soft breeze that carried on unending song. The song was distant and quiet, but pleasant to hear. However, after acquiring Muerte, Va'tet's inner world changed to an endless graveyard. On closer inspection, however, this graveyard is what became of the previous world after Va'tet killed her Zanpakuto spirit, as all the trees and small hills are in the same locations. The graves are neat and orderly, but extend forever in every direction. The sky is now experiencing an eternal night, though the blood moon is full, lighting the graves with its red brilliance. The song in the constant breeze is different now, and sounds to be some kind of Latin chanting, though it's too distorted to make out the words. Muerte himself can be found either lounging in a dead tree or walking among the graves. History: In an unusually warm winter of the human year nine hundred and ninety six, there was much celebration on Veratrax Peak, the capitol village of the Vastine Amorte. Births were not common among the avian Species, but this was a special birth. One of the oldest Vastine Amorte had just given birth to a healthy daughter, born with the four wings mutation and the palest of feathers. The Vastine Amorte mother was near the end of her long life, but the Vastine Amorte were capable, if unlikely, to give birth well into their golden years. The mother, who was known as Tsuyosa, named her daughter Va'tet, "Silver Sun," before handing her over to the woman who would be raising the crying infant. This was not so unusual; many Vastine Amorte, especially the older ones, lived highly mobile lives and entrusted their children to the village nearest when they felt ready to give birth. The woman entrusted with Va'tet's care was named Ma'tsun, "Fiery One," named for her vibrant red and orange feathers and hair. She found it a great honor to raise Tsuyosa's daughter, knowing that Tsuyosa's children were considered "nobility," which apparently made them important, in the city called Seireitei. Ma'kine, the one who had rebuilt the village on Veratrax, worked and lived in that city, and Tsuyosa told Ma'tsun that she wanted Ma'kine to take Va'tet to the Seireitei when the child was old enough. In exchange for raising Va'tet and eventually giving her to Ma'kine, Tsuyosa gave Ma'tsun stories, tales of all the places and wonders that Tsuyosa had seen since her youth, so very long ago. In the village of Veratrax Peak, where private ownership meant nothing, this was the greatest payment. Though every member of Veratrax shared everything, and all did their fair share of the hunting, mining and child-care, taking turns watching Va'tet when Ma'tsun was away either hunting, mining or rarely off to the Rukongai, the city around Seireitei, it was generally accepted that each person living in the village had a home they preferred, whether it be due to the colors, layout or position in the village. Ma'tsun lived in a newer home, carved into the face of the mountain, below the village proper. The original village was exactly the way it had been in Ma'kine's youth, though several inches lower due to how he rebuilt it. But, the village had been expanded on, carving steps and paths into the mountain itself, terracing the giant stone. The Vastine Amorte living there were careful to always build on the eastern side of the mountain, for the mines extended west-wardly and down from the village center, where the entrance was built. The front of Ma'tsun's home was stone, with two circular windows on either side of the door, which was a simple wooden door with the rune for fire carved in patterns into the wood. The inside consisted of a wood-plank floor with only two rooms, the main room and a bedroom. Both had fireplaces, with simple furniture, chairs and a bed in the bedroom, with a table in the main room for either sitting at or eating. Though she herself had never had children, Ma'tsun wanted them dearly. The Vastine woman raised Va'tet with care, and for many years, she followed a routine centered on the infant that balanced her responsibilities while caring for the child as often as possible. Every morning the Vastine woman would go hunting, then come home as the infant awoke, feeding her and taking care of her. At night, she would tell the child stories of Tsuyosa's adventures throughout the world, telling a new story nearly every night. And, when the baby girl finally slept, Ma'tsun would delve into the mines for a few hours if she was needed. Ma'tsun was happy. Nearly two and a half centuries came and went, the fastest, yet longest, years of Ma'tsun's life, and only the beginning of Va'tet's. At only four years old, physically, Va'tet was so mature. She could speak quite well in the Vastine language and had a basic grasp of the language spoken in Seireitei, and though Ma'tsun frequently scolded her for doing so, could hover and fly short distances on her wings. Va'tet hadn't grown into her wings yet, her body still small compared to the huge four wings that cocooned the little girl whenever she slept. The young Va'tet was well loved by the village, the only little girl in the village at the time, though another Vastine Amorte was recently pregnant, but would not give birth for a long time. Va'tet stood in the living room of Ma'tsun's home. There was a man in the house, one she hadn't known. He was very muscular and tall, with wings that bent three times. She wasn't sure why he was here, though she was standing in front of him. Ma'tsun was behind her, brushing her light hair with an emerald comb. The young Vastine Amorte didn't know why Ma'tsun wanted her to look nice for the man, who was walking around their home and touching everything. Ma'tsun seemed to like him and maybe fear him a little. She didn't know why, cuz the man didn't seem important to Va'tet. He didn't help in the mines, or hunt for the village. She knew he never watched Va'tet, the young girl would have remembered him. But Ma'tsun was making an issue of the man's visit. Va'tet was dressed in her prettiest clothes, her hair brushed excessively, her feathers cleaned until they shone like the prettiest metals and gems. Va'tet just didn't understand it. Who was this Ma'kine and why should Va'tet care about him? Va'tet realized the man was talking to her and she blinked. She hadn't been paying attention, and he repeated himself, asking if she knew about the city and some place called Seireitei. Va'tet did know of the city, and she guessed Seireitei was just a fancy way of saying city. As the conversation went on, with Ma'kine and Ma'tsun mostly talking to each other and talking at Va'tet, the Vastine girl became increasingly annoyed and irritated. He was taking her away! Why? What did she ever do to deserve this? Didn't Ma'tsun love her anymore? Was Va'tet bad? She promised and begged, saying she'd never fly again if she didn't have to leave Ma'tsun. She didn't know this man, she hadn't ever left Veratrax. Why should she? This place was her home she argued, but the two adults shook their heads and Ma'kine waited patiently as Ma'tsun calmed the girl down enough, placating her with the knowledge that if Va'tet left, she would see Tsuyosa, her birth mother. Va'tet would be able to ask Tsuyosa all the questions she never could ask Ma'tsun. Ma'kine promised that Tsuyosa lived in a great big house in Seireitei with her family. The rest of Va'tet's real family, he said. Va'tet hung her head, holding Ma'kine's hand as the older man led her to the entrance of the mines. The mines were lit by torches spaced every so feet, and stretched for many, many miles. The two Vastine Amorte had to stop and sleep four times before Va'tet saw the sun again. They emerged in the forest, which Va'tet had seen far below the mountain whenever the sky was clear. Now the forest loomed over her and she moved closer to Ma'kine. Four nights with only the man for company was causing her to warm up to him more than she cared to admit. Ma'kine was a good cook, using the supplies at the multiple bases throughout the mines. He told her stories about the Seireitei when they had been walking, and now the curious girl was interested in this place where Humans, Giants, Werewolves and Vastine Amorte lived in peace. But down here, surrounded by the forest, Va'tet couldn't help but think of the wild packs of Werewolves who lived in the lowlands. She'd seen the scars left behind on Vastine Amorte hunters from fighting Werewolves, but had never seen one in person. Or a Human, or Giant. In fact, she realized, she'd never met anyone aside from other Vastine Amorte. Werewolves, she'd been taught, were savages meant to be both feared and looked down upon. But according to this man, Werewolves were respected in the Seireitei, and fulfilled an important duty. Ma'kine requested she keep an open mind about others, telling her that she should not judge others without knowing them. With little choice, she agreed. It was many days later that the trees began to thin out. Ma'kine told Va'tet that they had entered the farthest reaches of the Rukongai proper. Va'tet had learned from Ma'kine days before that the farthest reaches of Rukongai were the least civilized, the wildest and most lawless of places under the Seireitei's authority. District Seventy One, the most lawless zone of all, was her first introduction to the Rukongai. To say it was not flattering was an understatement. There were no houses. As far as Va'tet could see, it was more wilderness, just less dense on the foliage with a handful of tracks showing passage through this way. But, Ma'kine held Va'tet close to his side, and his wings shifted uneasily as they walked. It was nearly two in the afternoon when they saw the first body. Va'tet had screamed at first, but not because they were dead. The corpse was a Werewolf, just like the stories she'd been told. This one was male, and he was strung up on a tree, large wooden stakes through his forearms and shoulders. His body must have been there for several days, for it had started to decompose and the stench was foul. Ma'kine shielded the girl and hurried her away from the tree. But as they moved on, they came across others, Humans and Werewolves mounted on trees and stripped naked. Va'tet cried silently as the two came across a tree with a Vastine Amorte man nailed to it, his six wings spread and nailed to the trees around him. His wingspan was enormous, and judging by how gaunt his body was, it was evident he starved to death rather than was murdered. His body was fresh, still warm as Ma'kine took his corpse down. "He... he was a Sacred One..." Va'tet murmured as Ma'kine laid the body on the ground. The Sacred Ones were any Vastine with six or more wings and were revered among the Vastine Amorte of the mountains. "He was but a young man, Va'tet. And he was very far from home. The one who did this most likely can't be far away, but it would be wrong to leave this boy up there." Ma'kine held Va'tet to his side, rubbing her shoulder before he gestured for her to back away. When she did, Ma'kine took a knife from within his clothing, and touched it to the Sacred One's chest. There was a strange feeling in the air, as if the air was suddenly heavy, but then came a burst of heat from Ma'kine and the dead Vastine's body erupted into flame. Va'tet watched as the flames spread to cover his whole body, burning fiercely for several minutes before leaving nothing but ash behind. It was her kind's way to burn the dead and scatter the ash, but there was no wind here, and no cliff to throw the ashes from either. Ma'kine stared at the ashes for a while before telling Va'tet to follow him. The two did not find another Vastine Amorte corpse, and eventually stopped seeing the hanging bodies altogether. As they made their way closer to what Ma'kine called the Seireitei, which was still multiple days away, they came across scatterings of makeshift shelters. Though they came across others who were alive, all stayed away from the large winged man. Va'tet wondered why that was, and Ma'kine told her that as a Shinigami, he was, generally speaking, more powerful than those who weren't. And that most criminals were cowards at heart who only preyed on those weaker than themselves. Va'tet and Ma'kine made decent time, he told her, as they arrived in the First District. The houses were larger and cleaner here than any other, and Va'tet saw plenty of people who greeted Ma'kine and herself warmly. She found this place more familiar, but still alien. It was like home, in that people were constantly bustling about, going in and out of buildings and greeting one another in a jovial manner, but different in there being 'stalls' and 'shops' and privately owned homes. Animals she had never seen, called 'horses' pulled large, wheeled carts that were different from her understanding of them. These were wooden vehicles used to transport people and goods, with two to four large round wheels that made them easier to move on the flat street. Back home, a cart was used with 'rails,' or parallel paths on the ground that prevented it from straying, and they were metallic and used solely in the mine. Ma'kine had taught her much during their journey to this place, and the last few days they slept in beds in large communal homes called 'inns,' which required a 'fee' or exchange of money, another strange concept for the small metal disks Ma'kine handed the man were clearly not suited for any particular purpose. Ma'kine had shown her, however, how Kan is merely an idea given physical form. The value of the small disks with holes in their center was determined by the government of Seireitei and not the metal's actual function or worth. Regardless, Va'tet was incredibly pleased to have hot water to bathe in each night they stayed in an inn, and by the time they arrived at the enormous wooden door that Ma'Kine called a 'gate,' her feathers and hair were vibrant and radiant. Ma'kine held Va'tet by her shoulders as a massive man approached them. Va'tet's instincts told her to run, to flee, as this Giant stalked towards them, dragging a crude metal weapon on the ground. Some part of her mind told her it was called a 'sword,' but that part was drowned in her inner voice of fear. The Giant was easily over twenty times her size, and was dressed in heavy armor, head covered by a helmet bearing the visage of a terrible monster. "Be brave, Va'tet," Ma'kine whispered to her. "The Gatekeepers will never harm those with permission to enter." Then the older Vastine Amorte raised his voice. "Ma'kine, seeking to reenter Seireitei, along with my apprentice, Va'tet." The young girl stared in wide eyed amazement as the gargantuan man nodded and bowed in respect, turning to raise the gate from the ground. Va'tet never imagined anything so large could be moved by mortal hands, yet it steadily rose in height before Ma'kine ushered her forward, his arm and wing protectively around her shoulders. "All Shinigami can do this, Va'tet. Simply close your eyes and focus on the palm of your hand. Feel the beat of your heart, the blood under your skin. Extend your mind through your down through your arm to your hand. Feel the air on your skin, the moisture. Now... Reach beyond that. Extend your will past the barrier of your body. Picture your will forming a sphere, a ball, floating above your palm." Ma'kine's voice told her, neither strict nor lenient in his duty to teach. Slowly, a ball of light grew from the child's hand, which floated several inches from her skin. Va'tet held her concretation, determined not to break it again. This was her fifth attempt at manifesting her spiritual energy. While she did not lack for spiritual energy, she had not developed control yet, which was the point of this training. The four year old child stood on the railing of Ma'kine's home and store's second floor. Should she fall backwards, a twenty foot fall awaited her, broken only by the rows of tables below. As a Vastine Amorte, she was twice as likely as a human to end up with broken limbs. In this exercise, Va'tet had to learn to control her spiritual energy while maintaining her balance on the railing. While precarious, Ma'kine was ready to catch her should she slip. She couldn't get the sphere to solidify into a manageable size without bursting. She was tired and sweating from concentrating, but she obediently lifted her hand again, feeling the dwindling wellspring of power inside her. She pushed it, squeezing her power down her arm slowly, then faster until it bubbled out her palm. She could feel the power shakily rise, forming an inconsistent sphere of light. Sparks of energy whizzed from its surface, like embers, scattering around her. Then, without warning, the sphere burst, and the young girl gave a shout of fear as she felt herself fall. She closed her eyes, wings wrapping around her small body as she fell. Her screams echoed in her head for a long moment, before she realized she wasn't falling. Slowly her eyes opened, and she found herself suspended on a net of glowing energy. It was firm, but yielded to her light weight, bouncing her safely atop it. Ma'kine called this energy "Kido," specifically "Bakudo," the binding way. It was a more advanced form of the skill she had been practicing. It amazed Va'tet. While she struggled to produce a single orb of light, Ma'kine had constructed a complex web of energy in the blink of an eye to catch her as she fell. And he made it seem effortless, too. She wondered if she'd ever reach that ability. There was a faint breeze as the web lifted her into the air, the net setting her back on the ledge. "Keep trying, Va'tet. Your spiritual energy is higher than a Human's, so you should have more than enough to keep going. Your issue isn't lack of Reiatsu, it's skill. You need to practice control. If you can do that much, we'll move on to the next step." The practice lasted an age. By the end, the sun had set and risen, and the child was drenched in sweat. Her hair was limp and her eyes felt hazy. But, bouncing in her palm, was a glowing sphere of green light. She beamed up at Ma'kine, who observed her with calculating eyes. Ten minutes had gone by since she first formed the sphere, and though her arms and legs shook, the light held solidly to its shape. Finally, Ma'kine gave her permission to release the power. Va'tet slumped to the ground, panting now that she wasn't standing on the ledge. Her wings hung low, drooping with exhaustion. Never had she worked so hard to do something so simple before! Ma'kine told the tired girl to go to sleep, they'd begin again after she rested and recovered her spiritual energy. Va'tet woke up shortly after noon, and felt refreshed. As she should have! Six hours of sleep, and all she'd done last night was stand still and focus. She shook her head, going downstairs into Ma'kine's shop to find the adult. Her bedroom was a space between several large bookcases and shelves in Ma'kine's personal room upstairs. Even after all the time she'd spent living with the man, no actual bedroom had been built for her. She found the Vastine Amorte man in the kitchen, cooking. The smell was heavenly, and she asked if she could try it. Ma'kine smiled, offering her a bowl of deep red broth with chunks of meat and vegetables floating in it. She ate with gusto, asking for a second bowl, and then a third. She looked at her empty bowl in thought, then asked the elder what the next stage of her training was. "Next... we take you to school." There wasn't much to say about Va'tet's time at the Academy. Not because it was uneventful, but merely because of its brevity. Being tutored by Ma'kine, as well as taking on twice the usual number of classes, caused the child-like Vastine Amorte to finish the six-year curriculum in only two years. Over twenty hours a day for those two years were spent practicing her Kido and Zanjutsu skills, and meditating with her Asauchi. But, due to her extremely short time at the Academy, Va'tet graduated without a Shikai, and was placed in the Fifth Division, to make the best usage of her skill in Kido and lacking Shikai. Va'tet kneeled in the Captain Commander's office. He had just finished giving her new orders. The Vastine Amorte girl looked up now, seeing the garment the Commander had placed in front of her on a chair. The elderly Human told her to put it on. It was similar to a Haori, but rather than white, it was black with the symbol for Recon in silver on the back. Unsure, she slipped it on and found it accommodated for her wings, with folds in the fabric hiding slits. The Commander came around the desk, looking at the young Vastine girl. "I have an assignment for you..."
1236 AD- Moved to Seireitei to train under Ma'kine. Physically four years of age. 1275 AD- Goes to the Shinigami Academy. 1277 AD- Graduates early and is placed in the Fifth Division as a Shinigami. 1296 AD- Becomes the Fifth Seat of her Division. Physically five years old. 1331 AD- Becomes the Fourth Seat of her Division. 1373 AD- Becomes the Third Seat of her Division. Physically six years old. 1398 AD- Becomes a member of the future Reconnaissance Team, though there is no structure in the team yet. 1412 AD- Becomes Captain of the Reconnaissance Team. Physically almost seven years old. 1416 AD- Deployed on a mission to Hueco Mundo to retrieve an object of power and observe the Hollow forces. Physically 7 years of age. 1417 AD- Loses her Zanpakuto to the Alter of the Princes, but becomes the chosen wielder of Muerte. During their escape, she is injured and orders her Second to return to Soul Society and bring a rescue team to retrieve her and Muerte while she holds off the Arrancar and Hollows chasing them. In the battle, her communications crystal is destroyed. 1418- After months of constant attacks by Arrancar and Hollows, Va'tet is high proficient at using Muerte. In an effort to hide her presence, she swears off using any kido and suppresses her spiritual pressure. 1419- With supplies running low, and no means of returning home, Va'tet begins to raid Las Noches for food, stealing in to take whatever she can from the Arrancar. 1428- After ten years of solitude between battles with the Hollows and Las Noches, Va'tet finishes rebuilding the camp. She uses the flesh of fallen Hollows in place of destroyed fabric, and quartz or bone for anything else. 1430- Va'tet begins building fortifications around the camp out of quartz to stave off wild Hollows from attacking. 1460- Thirty years after beginning the project, and countless set-backs from attacks, Va'tet completes a wide, tall wall of stone around the camp, as well as laid traps around the small area. 1465- Va'tet battles a Las Negativas, named Viboratohep. Though she manages to survive, and the woman leaves without taking Muerte, Va'tet's mind is shattered and the entire encampment in ruins. 1466- With no supplies, Va'tet turns to devouring the flesh of Hollows to survive. 1612- Over a century of living off the flesh of Hollows and what little she can steal from Las Noches, Va'tet becomes incredibly ill with fever. Muerte manifests himself and takes care of the fevered girl, defending her from Hollows that dare try attack the camp. 1614- After two years of fever and recurring illness, the last of the Hollow taint passes from Va'tet's body, aided by her use of Kaido on herself. This leaves her Reiatsu pathways terribly burned, and she becomes unable to use Kido. Va'tet's forced to rely on what she can steal from Arrancar to survive. 1673- After months of practice, Va'tet and Muerte achieve Bankai together. 1674- Unable to survive in Hueco Mundo with the Hollows purposefully preventing her from obtaining any food, Va'tet and Muerte decide to permanently stay in a weakened Shikai state. To maintain this state, Va'tet must remain awake at all times. Her mental state deteriorates further. 1805- Over a century of consciousness has left Va'tet completely numb. She has no hesitation in her attacks, going instantly for what would be kill shots. This cold indifference does not sit well with Muerte and he takes his malcontent out on their victims. 2017- Hundreds of years after hardening her heart and suppressing her emotions, Va'tet is met by Captain Kagayakashi Kibo from Soul Society. Together, they attempt to leave Hueco Mundo, but are met by the Primera Negativas. The two barely escape with their lives. After many centuries, Va'tet returns to Soul Society, her mission completed.